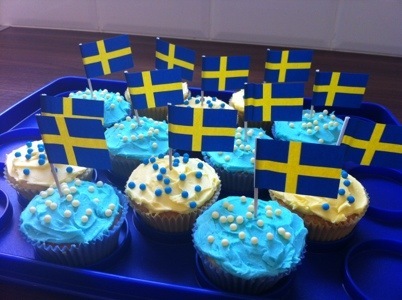 Today is Sweden’s national day so I’ve made some cupcakes in celebration. We’re at my parents and even though it’s sunny and quite warm outside I’m sitting outdoors with a blanket. It’s a tiny breeze which makes it uncomfortable for my joints and as I’ve a little pain already I don’t want to make it worse. Tonight we’re going to grill skewers. Pork, beef, chicken and shrimp… Yum!